Venice is extremely popular for travelers. So much so, that the government is taking measures to limit tourism. Huge crowds descend upon the city during the warmer months from cruise ships, which is why I’d suggest going in the off season. But maybe try to avoid historic cold fronts like the one that hit the city during February of last year… when I went. I wanted to stay at the Hilton Molino Stucky, which I have heard is by all measures a fantastic place to stay, but at the time of booking, my balance of 0 HiltonHonors points, and higher than usual cash rates prevented this. We instead ended up using a booking site to browse the available hotels for the dates of our trip. Most of the choices consisted of independent hotels, unaffiliated with most of the major chains, although there are also several points hotels to choose from in addition to the Hilton if you’re so inclined. Between browsing the choices online, and ultimately walking around the city during our trip, I certainly left with the impression that these independent operations constitute most of the available accommodation. At least, that is, if you want to stay within the city itself. We ended up staying at a place called the Hotel Saturnia International. It was very nice – I’d call it somewhere between a 4 and 5 star hotel, and because our stay was in February, rates were only around $120 USD per night. It’s a short walk from the Grand Canal, but our room still offered nice views of the smaller canals that bordered the property. At the price we paid, I’d highly recommend the Hotel Saturnia International, but during the warmer months, their prices do appear to be substantially more, which might cause me to hunt a little harder for a bargain elsewhere. Venice has plenty to offer, much of it walking distance within the canals and islands that make up the central area of the city. 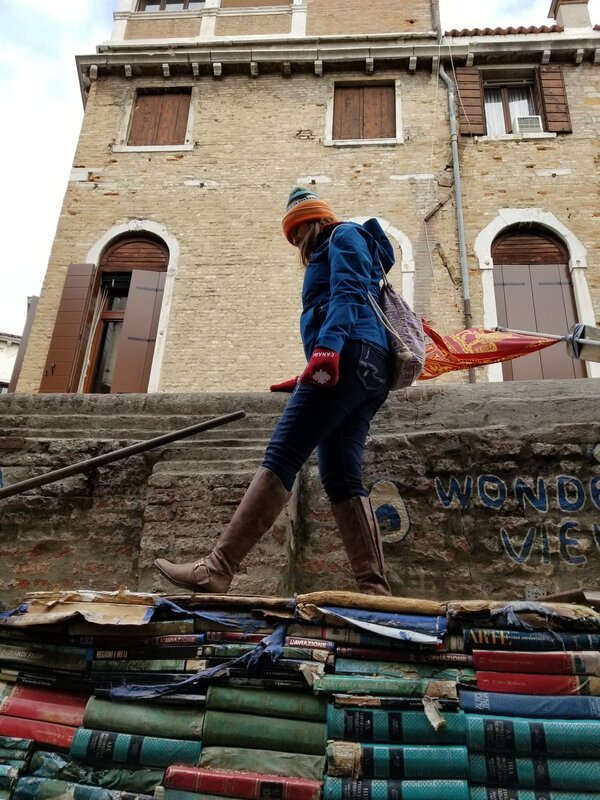 One of the first things we did was pay a morning visit to St. Mark’s Campanile, the tower in the Piazza San Marco, and one of the iconic buildings in the city. The tower opens at 9am, and is extremely popular with tourists, so be prepared to wait in line, even if you are early and happen to be visiting during a historic spell of cold weather, like we were. With your purchased ticket, you can ride the elevator up to the open air viewing deck, and enjoy the views that are without a doubt worth a short wait in line in the freezing cold. If you would like to enjoy some panoramic views of the city but aren’t willing to wait in line, another option is available. The Scala Contarini del Bovolo is located towards the center of town, away from the Grand Canal, and is one of the other tall structures in the city. Although it is not nearly as tall as the Campanile, it still has great views of the city, and is not nearly as overrun with tourists. When we visited, there were only a handful of other people there. The building also serves as a museum, and your admission ticket includes access to several large rooms filled with artwork to enjoy. Without a doubt, the other site in Venice that will be totally overrun with tourists is the Rialto Bridge. This is the footbridge that people likely picture when they think of Venice. It traverses the Grand Canal in the center of town, and is large enough that it is filled with shops selling a variety of tourist trinkets. This is basically the center of the Venice tourist universe, and I was pretty disappointed with how tacky and mobbed with tourists it was. I wouldn’t avoid it by any means, but I also didn’t think it was worth going out of the way to see more than once. The other famous bridges in town are much less packed with tourists, and in my opinion, every bit as picturesque as the Rialto. However, the one thing to keep in mind is that the Grand Canal is quite wide, and therefore not crossed by very many bridges. The canal snakes through town, so you will have to cross it on several occasions if you are on foot, so you should keep in mind that there really are only a few points to cross if you aren’t planning to use the water transport options. Although there are dozens of smaller canals crisscrossing the city, these are generally much narrower and have frequent smaller bridges connecting each side. Venice of course is also home to numerous churches dating back hundreds of years. Most of these churches are beautiful to behold from their exteriors, and a few are so impressive that they’re impossible to miss (Basilica di Santa Maria, Basilica di San Marco). Another one though, is a little less obvious to casual fans, but still had a lot of interesting history on the inside. The Basilica dei Frari is big, but not particularly notable compared to what seems like the hundreds of other beautiful churches throughout the city. However, we found the inside to be particularly interesting and noteworthy, so if you’re walking past all the beautiful and imposing exteriors and can’t decide which merit a look inside, add this one to your list. One final point of interest I’d recommend is the Acqua Alta Book Shop. This bookstore is pretty well known for its boats and bathtubs filled with books, and is definitely worth a visit for their collection of random old crap, and of course for the staircase of books leading to a canal view.